The first trailer for Oscar-winner Kathryn Bigelow’s (The Hurt Locker, Zero Dark Thirty) highly anticipated new film, Detroit, has premiered via Annapurna Pictures. The film, which was written by Mark Boal (The Hurt Locker), chronicles the Detroit riots of 1967. The riots are historically known to have been initiated by a police raid of an unlicensed bar in the city’s Near West Side when confrontations turned violent, ultimately resulting in the deaths of thirty-nine people and leaving hundreds wounded as the riots went on for five days. Bigelow and Boal have seemingly approached this event with the idea of telling several different accounts that occurred over the course of the five days in order to paint a full picture of what happened, why it happened, and how those on either side of the law were forced to handle themselves. In typical Bigelow fashion the film seemingly holds a number of tense moments while the ensemble cast as led by The Force Awakens' John Boyega are seemingly giving top notch performances to only accentuate that suspense further. Though not overly familiar with the details of the events that happened in Detroit that summer the tagline for the film, as shown at the end of the clip, hints that the film will paint a picture from a perspective most history books aren't accustomed to telling. I'm anxious not only to see what a talented filmmaker like Bigelow does with such material, but also the kinds of conversations it creates given the material couldn't be more relevant or a more timely reminder for the American conscience. The remainder of the ensemble cast includes Chris Chalk, Nathan Davis Jr., Kaitlyn Dever, Austin Hébert, Joseph David-Jones, Malcolm David Kelley, John Krasinski, Jacob Latimore, Anthony Mackie, Jason Mitchell, Hannah Murray, Ben O’Toole, Will Poulter, Jack Reynor, Algee Smith, Peyton Alex Smith, Jeremy Strong, Ephraim Sykes, and Leon Thomas III. Detroit opens in theaters on August 4th. 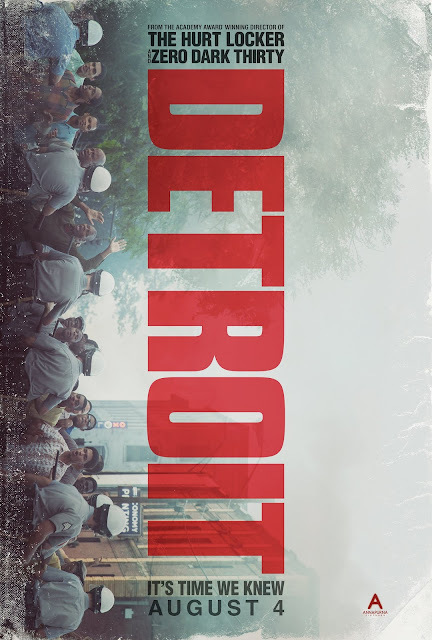 Synopsis: From the Academy Award winning director of THE HURT LOCKER and ZERO DARK THIRTY, DETROIT tells the gripping story of one of the darkest moments during the civil unrest that rocked Detroit in the summer of ’67.